There are many great things to be said about internet publication. It’s free, it’s instantaneous and any boring person like myself can get his thoughts out there and have them found by interested parties. The unfortunate thing about it is that any idiot can find it too. If you write in print or for a price, idiots still read your work (or worse yet, get secondhand accounts that substitute for reading), but there is a higher barrier to entry than a lucky Google search. No matter how many disclaimers you put on a post, the reader can always ignore them. The reader can quote you out of context by means of a simple copy and paste that any semi-coordinated five-year old could manage. No matter how careful you are, there is a decent chance that your disclaimers will be ignored and your words will be turned on their head. Making the disclaimer more strenuous will do no good, naturally, but it’s the only option available to the blogger. If you find this site via a Google search and fail to read and understand the next few sentences, that's on you, not me. These predictions are offered in the spirit of fun, not science or anything resembling science. They are one man’s opinion, one man’s wild guess at an unknowable future. If you do not believe that future is unknowable, if you think that you are blessed with some special insight that allows you to predict the outcome of pennant races, you are likely incapable of understanding this point, but nevertheless: even if you could predict exactly how many runs a team would score and allow over the course of the upcoming season, you still could do no better than predict their win total to within a standard error of four games. Of course, some folks predictions will be more accurate for a single season. Some will be better over the long haul, too, although expecting a persistent and consistent performance is folly. It is quite possible that I am poorer than most at this exercise. Understand, though, that the picks that follow are the product of one man’s feeble mind. They do not in any way, shape or form reflect the predictions of “sabermetrics”. They are not based on any sabermetrically rigorous procedure; I do some very crude estimates of team runs scored and allowed based on freely available projections, but then I substitute my own opinion wherever I feel. If you want predictions based on a more rigorous sabermetric procedure, you need to visit Baseball Prospectus or the Replacement Level Yankee Weblog or somewhere, anywhere else--not this blog. Another point I make every year but which is hopelessly lost on the mental midgets who invariably stumble upon this page is that the format distorts my true feelings. I have limited myself to the format of ordinal standings rank not because it is a better format, but because to do what is more telling, offering expected wins and probabilities, requires the use of a rigorous procedure to be remotely credible, and then it becomes harder to shrug it off as a fun, seat-of-the pants exercise. Given the constraints of the ordinal prediction format, one is forced to predict which team will win the NL Central, and which will finish second, and all down the line. In reality, I have no idea who will win the NL Central. I believe that three clubs--Cincinnati, Milwaukee, and St. Louis--are essentially equal in their chances. A fourth, Chicago, could certainly win if things broke their ways. And while it may be unlikely, one cannot give true zero odds to the possibility of a miracle in Houston and Pittsburgh. Add it all up, and I wouldn’t be willing to give you better than a 35% chance that any single team wins. But making an ordinal prediction gives the impression that the predictor believes that the team listed first has an expected outcome of first place. The intelligent reader and prognosticator understand the difference and don’t need to have it spelled out. I agree with the consensus view--the Red Sox look to be the best team in baseball. Their offense should be great, their starting pitching might have only one truly safe bet in Jon Lester but also features four guys with the potential to pitch really well, and their bullpen has three big arms (albeit perhaps with two empty heads) at the back. Too much is being made of the Yankees' pitching concerns, I believe. There are a lot of teams expected to contend with question marks at the back of their rotation, but since we're conditioned to see New York run out four guys with track records, it looks worse than it is. I was very tempted to pick the Rays second, but it would be a dishonest pick for shock value. This should still be a very competitive ballclub, and there a couple divisions I probably would pick them to win. The mainstream is spending too much time fretting about losing Pena, Garza and Bartlett and not enough recognizing that their performances in 2010 were far from irreplaceable. Crawford is obviously a much bigger loss, as is their bullpen's splendid 2010 performance which couldn't be replicated even if they were all still in St. Pete. The Orioles are not nearly as close as they seem to think they are, but I thought they'd be better last year and meeting those expectations could be enough for fourth place. I like Alex Anthopoulos' moves as much as the next guy, but I liked much of what Jack Zduriencik did last winter too. I don't think the Blue Jays project to be a better team than they were last year, and their homer-happy offense is almost surely unsustainable. If you had to fall into the silly cliché trap and pick “this year's Mariners”, you could do worse than Toronto. The Rangers are my reluctant pick--I love to pick against pennant winners without sterling regular season records, because the mainstream halo effect for playoff success is far too strong. Like the talk of the Twins dangling Liriano, the decision to keep Feliz in the bullpen gives off a sense of complacency and overconfidence. However, Texas does look like the strongest club on paper. Of course, games aren't played on paper, and so if the great clubhouse influence of the sainted team-player Michael Young is dispatched, they will plummet to 100 losses. The A's made an effort, but their offense still makes them hard to pick. They also don't have a strong Buster Posey candidate to emulate the 2010 trick of their baymates. The big splash Tony Reagins promised for the Angels was fulfilled if you think about “big splash” in terms of Olympic diving. The Pythagorean fairy better bring some extra pixie dust. The Mariners have to score more runs, don't they? Don't they? Four aces = unbeatable! The pitching fetish that still looms large in the conventional narrative demands that tribute be paid to the Phillies, but would it be sacrilege to point out that pitchers often get hurt, and an offense built on a bunch of players on the wrong side of thirty whose best player is a major injury question might be a little vulnerable? Just checking. The Braves have been my irrational NL pick for some time now; since they finally rewarded my faith with a playoff berth, there's no reason to stop now. The bullpen is due for some regression, but the starting pitching looks fine and they should score some runs. The Mets look like a .500 team, which means the ratio of lamenting how bad they are to reality will be way out of whack. The Marlins seem stuck in neutral, even if they hadn't traded Uggla; even if you believe in success cycle theory, it's no one's birthright to win the World Series on a six-year cycle. This might be the MLB division with the most delusional owners; the Mets apparently put all their eggs in one basket, Loria thinks his world title is two years overdue, and the Nationals think that Jayson Werth + Stephen Strasburgh + Bryce Harper = 2012 contention without a lot of downside risk. Good luck to all. My crude projections have some kind of borderline irrational love for the Cardinals. Perhaps it's the fact that they ignore fielding; perhaps there's some truth there. Picking them to win after the Wainwright injury in an already close division may seem foolish, but what the heck? At least I can point to the fact that it's not alone—PECOTA also puts St. Louis on top, albeit by an insignificant margin. The Brewers have shown a tendency to go for it with gusto by trading for starting pitchers, and while I wouldn't want my team doing the same, it could very well pay off in this division; and for the moment, fate has smiled upon them. The Cubs probably aren't as close to winning this division as the Garza trade suggests they think, but a lot went wrong for them last year (some of it of their own volition, mind you), obscuring the fact that in 2009 they were kind of in the mix. My own intuition tells me that the picks for this division are scrambled, but the spreadsheet really doesn't like the Reds that much, and I can see why. Their offense still has issues at short and in left, Scott Rolen was a big contributor in 2010 but at this stage isn't the most reliable guy around, Joey Votto isn't really Albert Pujols Jr., and I'm not really a Drew Stubbs believer. They don't really have a leadoff hitter (which I point out not because the leadoff role is particularly important but because they either don't have or don't trust high OBA guys without power), and you still have to wonder about Dusty's ability to push the right the buttons if things don't go according to plan. The starting pitching has solid depth, but they also lack front line starters barring a Cueto or Volquez breakout. They are certainly the team I've picked fourth in a division that I think has the best chance to win it--again, that's the inherent peril in using an ordinal standing prediction approach. It should go without saying that they're much closer to St. Louis on paper than they are to Pittsburgh. The Pirates should not lose 100 games again, and the Astros might be as good of a bet as any team in the game to do so. I really don't like picking the Giants. Winning the World Series doesn't wipe the fact that their playoff berth was not secured until the final Sunday of the season out of existence, and their offense is still quite suspect. However, the Rockies didn't do much to improve; I wouldn't be surprised to see serious regression from Carlos Gonzalez, and my crude projection attempt sees them as a .500 team. The Dodgers could surprise some people since expectations are not particularly high. Their pitching staff should be one of the best of the NL (at least before park adjustments), but there are a number of weak/questionable spots on offense. The Padres obviously traded away their best player without much coming back to help them in 2011; still, they should be respectable. The Diamondbacks may think that shedding strikeouts is the magic elixir to increased offense, but you still should expect to score more runs with Mark Reynolds as your third baseman than Melvin Mora. While I think they are far from a juggernaut (just as I thought during last year’s postseason), I would have to admit that the Phillies are the team most likely to win the NL pennant and the NL East. However, my estimation of their chance to do so is so much lower than that of the mainstream that to pick them to win and thus replicate everybody's prediction would be boring. I almost feel the same way about Boston--the scattered talk about winning 110 games is irrational. However, I think Boston stands out from the pack more than Philly, and picking against your head twice is just a waste of everyone's time. My crude standings projections have the Giants second in the NL behind the Phillies, but picking them would be even worse in terms of overvaluing the previous postseason and assuming repeats, so the mantle falls to the Braves. It doesn't feel like he should be eligible, but he is. Let's try this again. I picked him last year and he had a fine season, but not a spectacular one. I always like to pick a newcomer for MVP if possible (voters love shiny things), and Fenway should help the mainstream perception of his performance if nothing else. Having a job is half the battle. I was going to pick Zack Greinke, but missing a few starts is a hurdle to overcome. You know that the writers are just dying for an excuse to give this to Ryan Howard. Spending all that money on Jayson Werth leads me to conclude that the powers that be in Washington think they're a stronger club than they are. Most obnoxious stories of the year: Michael Young, Pujols' contract status, Nolan Ryan taught the Rangers pitchers to do X, Josh Hamilton, whether various starters turned relievers should be used in a sane manner (Chapman, Joba, Feliz)...basically the Texas Rangers, win or lose. 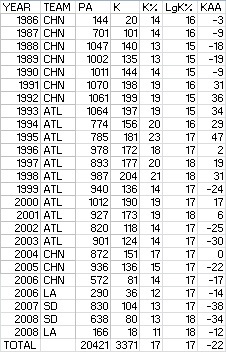 I have posted an updated spreadsheet with park factors for all teams, 1901-2008, as a Google Spreadsheet. These are five-year park factors, calculated in the same manner I describe on this page. The guiding philosophy was to try to include as much data as possible. If there are five possible years of data to be used for a park, they will all be used, even if four of the seasons were in the past or in the future. The source of the raw data was KJOK’s excellent park database for past seasons and various sources (most notably Baseball-Reference) for recent seasons. The reason the park factors are only shown through 2008 is that my ideal data set is two previous years, the year in question, and two future years. For most of the parks active in 2009, we will after 2011 be able to fill this dataset, and so I don’t want to publish a park factor now and change it later. However, there are parks where the 2008 or 2007 factors are not yet settled because they are new and there are not yet five years of data available. In these cases, I have listed a PF but marked it as one that will change in the future (this is indicated with an orange shading; park factors for the first year after a switch are in pink text). Now I will give an example of how I chose the years to be considered in figuring the PF. Suppose we look at the Diamondbacks, who have played in Bank One Ballpark since 1998. In 1998, we have no previous data, but there is four future years of data, so the sample is 1998-2002. For 1999, there is one previous year, so we also look at three future years, and get 1998-2002. For 2000, there are two previous years, so we use two future years, and have a sample of 1998-2002. This is now in the ideal format--the year in question, plus the two immediately prior and future years. Of course, in 2001, we use the two previous years (1999 and 2000), and two future years (2002 and 2003), making the total sample 1999-2003, and it will continue in that manner until something changes. In the previous iteration of these park factors, there were three recent parks for which I needlessly inserted a changepoint and thus changed the factors for the surrounding seasons. These teams were pointed out by Terpsfan101, and I have corrected their PFs in this edition. They are Detroit, 1994-1999; Minnesota, 1989-1995; and Seattle, 1993-1996. If you close your eyes and dream just a little bit, you can see the Indians contending in a division without a clear favorite. A healthy Grady Sizemore and a healthy Carlos Santana teaming up with the overlooked Shin-Soo Choo to form a secondary average all-star wrecking crew at the heart of the offense. Maybe Matt LaPorta lives up to his potential, just a little, and provides average first base output. Michael Brantley is able to get on base, and Asdrubal Cabrera fields well, and second and third base are not complete black holes. Meanwhile, the bullpen is anchored by Chris Perez, with Rafael Perez and Tony Sipp combining to give the Tribe two solid left-handed relievers. A couple of other somewhat promising righties take bullpen spots and run with them. That team is no threat to win 100 games, but it could win 87 games. “But wait”, you say. “Your rosy scenario said nothing about the starting pitching.” Oops. And that is the problem with the 2011 Indians in a nutshell; they might not wind up having a good offense or a good bullpen, but it's not that hard to envision how it might happen. On the other hand, it's very hard to see the starting pitching performing in a manner that could make Cleveland a legitimate threat in the AL Central. Carlos Santana will be the catcher, and is said to be back to normal after recovering from the knee injury that prematurely ended his rookie season. Even assuming that to be reality, it's easy to see Santana being something of a disappointment to fans in 2011 after hitting .261/.408/.469 in 187 major league PA. Whether those expectations are met or not, Santana should be on of the Tribe's best offensive players and have the bat to carry first base, where he is slated to see some time. The competition to be his backup will continue throughout the spring. Lou Marson started last season as the Indians catcher, but my money would be on him beginning the season in Columbus. He's still young enough that the organization would presumably like to get him some regular playing time rather than the rare chances that figure to come behind Santana. That leaves an assortment of uninspiring choices (veterans Paul Phillips and Luke Carlin and youngster Juan Apodaca). I would be very surprised if it was Apodaca, and the fact that Marson is already on the 40-man roster may wind up winning him the position after all. At first base, the hope that Matt LaPorta could be the impact hitter that would really make the CC Sabathia trade payoff have essentially been extinguished--it's now just a question of whether he can be an adequate major league hitter at the position. The jury is still out on that, but his former prospect status still has at least another year or so with which to tease observers. LaPorta has seen time in left field in the past, but appears anchored to first base now. Second base figures to be a black hole for the team as it has been since Asdrubal Cabrera moved across the bag for good. Luis Valbuena played himself out of Cleveland's plans last season, and while he is in camp and ostensibly competing for the job, the odds against him are staggering. If the team wouldn't promote Santana at the outset of the 2010 season, you can forget about seeing prospect Jason Kipnis (or Lonnie Chisenhall at the hot corner, although he is considered to be farther away anyway). That leaves Jason Donald, who'll likely instead be slotted at third base, and non-roster invitee Adam Everett as options (and let's be honest--if you're not going to use Everett's shortstop glove, you're not going to put him in your everyday lineup). Thanks to this grim outlook, the Indians decided to bring in a veteran to at least give a steady presence at the position--Orlando Cabrera. Cabrera really doesn't offer much more than his name at this point, but given the choice of watching Luis Valbuena or just about any human being other than Muammar Gaddafi, things could be worse. Third base is the other position where the team has thrown their hands up. Jayson Nix was thought to be the favorite, and will almost certainly be on the team one way or the other, but his late season trial at the hot corner was scary from a fielding standpoint, and the man has a career 77 OPS+ in over 700 PA, so it's not as if there's a tradeoff being made between fielding and offense. Donald now appears to have the inside track on the position, but he too leaves much to be desired offensively. Jared Goedert, who hit 27 homers between Akron and Columbus last year, will also get a look, but at 26 and without much a previous track record, he's more suspect than prospect. Jack Hannahan is also in camp as an option of last resort. Cord Phelps, like Chisenhall and Kipnis, could be a midsummer or later addition to the team. Phelps is trained to play some third as Kipnis has surpassed his as the second baseman in waiting, but third base puts him in competition with Chisenhall, so he may really be preparing to take a utility job down the line. The Indians will have decent flexibility, as Cabrera and Donald can both back up short and second; there will be no need for an Everett type to be tacked on the roster solely for Asdrubal Cabrera's days off. The outfield picture is much clearer than the infield, particularly if Sizemore is able to perform. Right field belongs to Shin-Soo Choo, who is not really appreciated by the home fans anymore than the general consensus. If you tried to tell a typical Tribe fan that Choo was roughly comparable in value to Carl Crawford in 2010, they'd laugh you off as most people from Chicago or San Francisco would as well. Sizemore will likely not be ready for Opening Day; apparently two weeks into the season is the target, but personally I don't expect to see him before May. The brass seems to be committed to playing him in center when he returns, but left is a possibility with Michael Brantley sliding over to center as he will in Sizemore's absence. I remain a Brantley skeptic, as he has yet to display a hint of power; he will need a .350ish OBA to be an asset. His .270 BABIP suggests some bad fortune, but given that his major league OBA is .313 in over 400 PA, it's going to take more than a few hits dropping in to make him a legitimate major league outfielder. I was not particularly pleased that Austin Kearns was brought back; his hot start obscured the fact that he was a below average hitter in a corner position. He does provide a right-handed bat to platoon with Brantley, and he's borderline playable in center (as is Choo), so he brings a bit more to the table than Shelley Duncan. Duncan is left-handed, more of a liability in the field, and has performed no better at the plate. He'll probably make the team anyway and also see time at DH, particularly on days Hafner is scheduled to sit and a righty is pitching. Travis Buck, signed to a minor league deal, is a more intriguing option, similar but more useful in the field than Jordan Brown (a LF/1B). Both are left-handed, which is problematic given Brantley's presence. Trevor Crowe would be another candidate for the bench, but he is held back by an injury and may not be ready for some time. Ezequiel Carrera, Chad Huffman, and Nick Weglarz are also in camp but don't figure to win a spot on the team. Travis Hafner is the DH, and it's worth noting that he still contributes to the offense. 5.7 RG is still an acceptable and even slightly above-average performance from a DH. 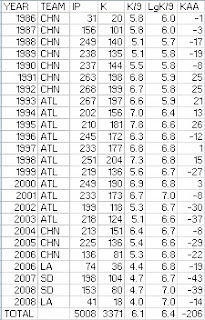 His production was similar in 2009--5.9 RG, which was actually a little worse relative to the league. The problem with Hafner as a player is that he requires frequent days off due to nagging elbow problems (only 118 games in 2010 and 94 in 2009). The real problem with Hafner as an asset is his massive contract, which still has two years and $26 million to go (one could argue that his platoon splits make him a liability against southpaws, too, I suppose). However, the typical Tribe fan carries on about Hafner the hitter as if he's completely useless, unable to separate judgment of the contract and the memory of the hitter he was from a fair assessment of the hitter he is. Nick Johnson was a late addition to the first base/DH mix on a minor league deal. Usually I'd be very excited about Johnson joining my team, but with the Tribe not going anywhere there's really no reason to throw obstacles in the path of letting LaPorta take 600 PA. Johnson can also fill in at DH, and gives the Indians the potential to have a number of Secondary Average beasts (joining Sizemore, Choo, and Santana); of course, concerns about his effect on opportunities for other players have a high probability of being rendered moot given Nick the Stick's injury history. The Indians' starting rotation is pretty well set, barring injury; this can be a good thing if you're the Phillies or the Giants, and a bad thing if you have Mitch Talbot and Carlos Carrasco locked into starting jobs. Fausto Carmona will take the ball on opening day; there has been so much written about him that I feel completely incapable of providing any analytical insight. Carmona stands out from other pitchers that have had flukish Cy Young type seasons (Joe Mays and Esteban Loaiza come to mind in the last decade) because he does have the stuff that makes you want to overlook the low strikeout rates and believe that he could be an exceptional pitcher with an unusual profile. But believing doesn't make it so, and Carmona is a groundball pitcher typecast as an ace by a team desperate for an ace that doesn't have very good infield defense. Left-handed batters have remained the scourge of Justin Masterson, and as such he might well be best suited for a relief role. However, of all teams Cleveland needs to try to resist that temptation as long as possible. While as a rule I'd usually support not giving up on a pitcher's rotation potential until absolutely necessary, it is even more imperative in the case of Masterson and the Indians. The team is thin in starters, and three of the team's top pitching prospects (Alex White, Jason Knapp, and Nick Hagadone) are considered to be potential future relievers. Mitch Talbot is a perfectly acceptable back of the rotation filler type who'll likely slot third in this club's rotation because his 159 innings and 14 RAR in 2010 constitute a track record relatively. Carlos Carrasco's stuff has always outranked his results, but he pitched well in September and will thus be given a rotation spot with little resistance this spring. Fifth starter options are numerous, but most lack potential to ever be much more. Josh Tomlin and Jeanmar Gomez are forgettable righties, David Huff is the last man standing of the Indians once prodigious collection of left-handed soft-tossers with the rade of Aaron Laffey.. Hector Rondon was one of the team's top prospects but has been stopped cold by injuries, while deadline trade swag Zach McAllister and Corey Kluber figure to be in the mix to fill in during the summer, but not break camp with the club. The aforementioned White has more upside and will also be a possibility late in the campaign. The wildcard in the fifth starter competition is Anthony Reyes, who will be given every opportunity to win the job. Reyes was acquired in 2008 and started 2009 in the rotation before requiring Tommy John. The Indians would love to see him physically able to pitch thanks to his experience if nothing else, but it is pretty clear that he will not be ready for Opening Day. The team was linked to veteran free agents Kevin Millwood, Jeremy Bonderman, and Bartolo Colon; the latter signed with the Yankees, sadly denying Tribe fans of seeing a former contributor return home and perhaps fall flat on his face with a flair not seen in these parts since Juan Gonzalez' one-game appearance in 2005. The former two remain on the market but each day diminishes the likelihood that they will turn up in Cleveland. Recent developments have made the bullpen picture clearer than one might expect under the circumstances. Chris Perez will be the closer, and is a good bet to disappoint; his .234 BABIP should go up, and even without using DIPS-inspired metrics, his peripheral RA was a good three-quarters of a run above the actual figure. None of this is to say that Perez will be bad, only that one should not expect a repeat performance of the second half, in which he was a lockdown closer. Rafael Perez and Tony Sipp give the bullpen a pair of left-handers who tease their potential to be more than specialists while often proving combustible on the mound. Chad Durbin, briefly an Indian in 2003-04 (~ 60 innings), has been signed to a major league contract and thus will be the team's primary middle innings reliever. The Durbin signing may seem unnecessary given the club's outlook, but it appears as if giving Manny Acta some hope of a stable, experienced right-handed middle reliever outweighed other considerations. Those four are locks; two others, Jensen Lewis and Joe Smith, are strong possibilities. Both were signed to contracts rather than being non-tendered, which leads one to believe that they will be pitching in Jacobs Field this year. Smith is a pleasure to watch if nothing else, and Lewis' childhood Indians fandom allows the fans a degree of warm fuzzies. The final spot appears to be reserved for a long reliever; if that is the case, two pitchers jump to the front: Justin Germano and Joe Martinez. Both have started and relieved in their careers; Germano has the upper hand as his BABIP gave the impression of effectiveness in 35 innings with the Tribe in 2010. If the team is willing to eschew a long man requirement, Frank Herrmann and Vinnie Pestano will be very much in the mix. Herrmann is a 27 year old righty without good stuff; his performance over 45 big league innings was average but he lived on a low walk rate (1.8 per nine) and a low strikeout rate (4.8). The fall off the high wire could be ugly. Pestano throws hard and impressed in his September callup; his AA and AAA performance was impressive as well (1.81 ERA, 77/16 K/W in 59 innings). It would be nice to see the team go with Pestano, as there really aren't any right-handers with power arms to set up Perez (I don't want to give the impression I have a fetish for power arms--”effective” arms would have worked too). Other relievers who could appear as the season progresses include Josh Judy, Jess Todd (definitely stuck in neutral at this point), Nick Hagadone (if moved to the pen), Bryce Stowell and Zach Putnam (who'll immediately become my least favorite Indian of all-time). There are a number of arms with potential in that group, and so it's possible that the Tribe bullpen could be a lot more exciting by September and perhaps positioned to be more effective in 2012. Last year I predicted a 74-88 season, which was five wins too many; I've learned my lesson and will go with 72-90 this year. It's dangerous to attempt to project further down the road, but I could see 2012 as a similar season to 2011 with some more young players breaking in, with 2013 as a season in which to make a push. But by that point the contract status of players like Sizemore and Choo will be an issue, and so it's best to keep an even keel and say that it's not at all clear when Cleveland's next contender will take the field. A best case scenario (really more like 90th percentile)? Let's say 81-81. The starting pitching makes it tough to go much higher even if one assumes favorable health for the offense and an effective bullpen. Worst case? Any time you expect to win 72 games, you could lose 100 if things don't go your way. I don't think this is the worst team in the majors, but only a homer could argue that median expectation wouldn't put them in the bottom third or quarter of the league. Sadly, this is an organization that needs a break from a public relations standpoint. The performance of the organization has been a disappointment over the last three seasons without question, but the fickleness of the fanbase has been a disproportionate response. Indians fans have every right to demand better from the organization, but when just four years ago your team was one win away from the World Series, it is unbecoming to act as fans of a club that has spent a generation planted in the second division. Perhaps more than any other fanbase, Indians rooters have swallowed the vision of baseball as hopeless for small markets hook, line, and sinker--even when they could simply look to the city's other major league franchises and see that salary caps can neither compel “homegrown” players to stay home (even when the team wins a lot of games and the player is actually from the area) or ensure that an organization will put a decent team on the field even once in a decade. The pathetic, feeble whining about a ballclub by denizens of a declining, corrupt city is a bit much for me. James has revamped Win Shares over the last couple of years to include Loss Shares. I think this is a very good thing, although I look forward to when (if?) the entire methodology is published. Without the full explanation, it's dangerous to comment about isolated details, but James' essay on "Explaining Defensive Win Shares to a Dead Sportswriter" is tough to ignore. My Twitter-friendly take on it: He's going to have trouble explaining it to a lot of people, not just dead sportswriters. Making outs increases the team's responsibility to play defense. When you make more outs, that increases the team's responsibility to play defense. Therefore, if two players are the same in the field but of them makes more outs, the one who makes fewer outs has to come out ahead when you compare the player's defense contribution to his defensive responsibility. While we are in the habit of thinking of offense and defense in baseball as un-connected, they are in fact not un-connected. There is a very important connect between them, which is the rule that for every out you make on offense, you must record an out on defense. Bill James is obviously a very intelligent man, and you a very intelligent reader, so I am hesitant to respond to this--the response should write itself. Limiting myself to a paragraph or less, I suppose it is technically true that each out on offense is matched by a defensive out, barring walkoffs and rainouts and the like. But there is no causation between the two. The rules of the game require three outs per inning and nine innings per team. Each team makes 27 outs regardless of the rate at which they use them (think OBA) or any other factor. An individual who makes outs at a higher rate than some comparison player does not increase the number of outs that his defense must record. The defense must record 27 outs regardless of what an individual does at bat. What does happen is that by consuming excess outs, the individual batter leaves less outs to be consumed by the other eight members of his lineup, and fails to generate additional plate appearances for them. James later seems to suggest that the revamped DWS-LS system assigns the same responsibility to field to each position, regardless of where it stands on the defensive spectrum. He then states his objection to offensive-based positional adjustments, and so it seems as if the stuff about making outs might be a backdoor way of applying positional adjustments. It's unclear, though, and still doesn't follow logically. James’ discussion of positional adjustments also seems to gloss over the use of defense-based positional adjustments or the fact that most of us who still use offensive positional adjustments do so because we believe they provide a ballpark estimate of the defensive differences between the positions. When I use an offensive positional adjustment, I'm not saying that I think a shortstop with a 5 RG is a better hitter than a first baseman with a 5 RG. What I am saying is that the difference between aggregate offensive performance between shortstops and first baseman (when considered carefully and over a long period of time) approximates the inherent difference in defensive value. You are certainly free to reject that argument (and many sabermetricians that I respect very much do just that), but please recognize that the sabermetrician using an OPADJ is likely not making the claim that a player's offensive contribution is altered by his fielding position. More important than my own positional adjustment folly is an apparent failure by James to recognize that the positional adjustments that are now used most prominently in the community (generally Tango's, which have made their mark on the PADJs used in WAR figures from both Chone and Fangraphs) are based on estimates of the defensive difference between positions, sometimes informed by offensive averages. Furthermore, the sources do not lump the positional adjustment into the offensive ranking--they break everything (offense, fielding, baserunning, position, etc.) into smaller components, which are then summed to produce RAA, WAR, or some other total value metric. Again, it is possible that I have misunderstood James' point, or that he has done a poor job of expressing himself, and that DWS is completely logical. However, I think it is going to take a much more thorough explanation of the system to give people that read the Gold Mine piece a lot of confidence in his methodology. One of the most thought-provoking essays is "Whiff 7", which discusses the phenomenon of strikeout rates continuing to reach all-time highs. James argues that there is no end to this in sight under current conditions, as teams have an incentive to find power pitchers but no disincentive to find batters that avoid striking out. James argues that the standard deviation of power (he doesn't use that terminology) has decreased over time, and so league homer rates have gone up while the top individual performers hit about as many homers as they did in previous eras. James then offers some suggestions of rule changes that would slow or reverse the trend. It's an interesting piece, and it didn't prod me to respond to it directly, but rather to make a tangential and mostly unrelated point about how we measure strikeout rates--a wholly unoriginal and stale one at that. I have for a long time advocated using K/PA rather than K/IP as the measure of pitcher strikeout proficiency (I’m not claiming this is unique, as others have carried that banner with much more vigor and coherent arguments than I have offered). Through no effort of mine, the use of K/PA has increased in the sabermetric community, with sites like The Hardball Times and Fangraphs prominently utilizing K/PA. For his career, Maddux struck out 6.1 per nine, while the league average was 6.4. He struck out 206 less batters than an average pitcher would have in the same number of innings. Without seeing the same figure for a lot of pitchers, it's hard to contextualize that, admittedly. Now Maddux' strikeout rate is essentially average--he struck out 17% of opposing batters, the same as the league average. 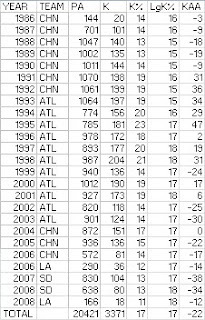 Maddux' career rate is lower (it's actually 16.5% to 16.6%), but just barely so, and by this metric he only recorded 22 less strikeouts than average. 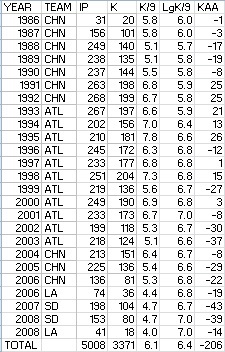 In Maddux' peak years (I think 1992-98 stand out), he was above-average even by K/9--+90 KAA, while he was an even more robust +196 when K/PA is the standard. This is not intended to recast Maddux as a strikeout fiend--certainly he was not, even at his best. Still, Maddux' strikeout rate is more impressive when viewed in light of the number of opposing batters he actually faced rather than in terms of innings pitched, which really is just a measure of the percentage of outs a pitcher gets via the K rather (this is obscured by displaying strikeouts per 9 innings rather than strikeouts per 27 outs). In addition to K/9, there are several other per-inning pitching ratios in common usage--H/9, W/9, HR/9, WHIP. What all of those have in common is that they are ratios of bad things (offensive successes) to good things (outs recorded). K/9 is a ratio of really good things (outs recorded by strikeout) to another set of plain old good things that includes the really good things (total outs recorded). As such, it's best viewed as a measure of a pitcher's reliance on strikeouts.